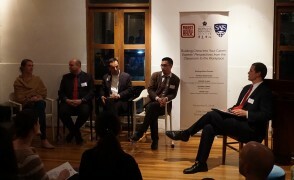 Last Wednesday, November 9, the Project Pengyou team cohosted a special panel event at Cafe Sambal in Shanghai with the Hopkins-Nanjing Center (HNC) and the Hopkins-China Forum on how to build China into your career. 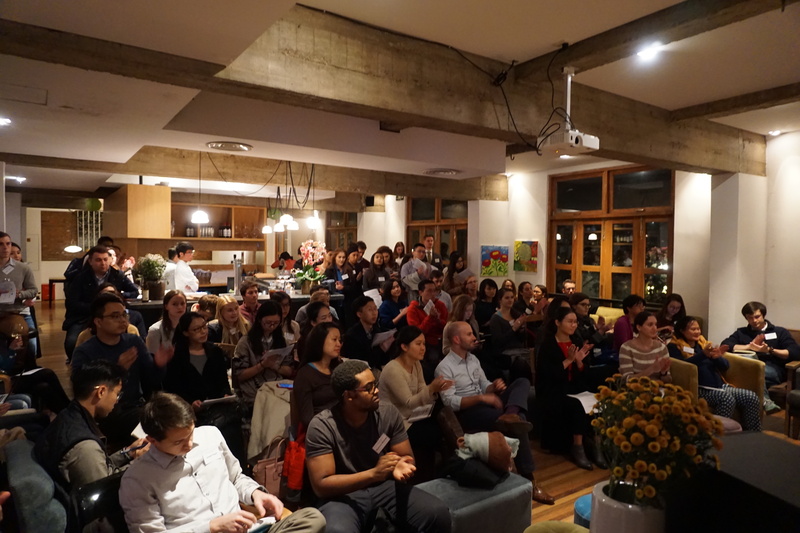 Last Wednesday, November 9, Project Pengyou cohosted a special panel event at Cafe Sambal in Shanghai with the Hopkins-Nanjing Center (HNC) and the Hopkins-China Forum on how to build China into your career. This was the second event in this series that we’ve co-organized with the HNC, the first being held in Beijing last year. Topics included getting started in your career, the importance of language skills, and what skills are needed to shape a meaningful China-related career. Panelist from left to right: Chynna Hawes, Trevor Clark, Francis Bassalino, and Frank Tsai sit with Robbie Shields, the event moderator. One thing that each speaker touched on was the importance of building up your skills in Mandarin (or English, for the Chinese in the audience). Francis took it one step further, noting that “language is necessary, but not sufficient” to land the job you want. And, as each speaker also noted, in terms of increasing your language fluency, there’s no substitute for diving headfirst into an immersion environment. Though they note that it may be intimidating and working in a company where you may be the only foreigner may not be your dream job, you’ll have the opportunity to be in direct contact with Chinese colleagues every day and learn cross-cultural communication skills. Similarly, for Chinese young professionals seeking jobs in a Western/English speaking company, polished English skills and a cosmopolitan outlook on the world are key, said Trevor. Frank said that as an employer, one of the biggest things he looks for in an employee is a willingness to learn. Trevor agreed, noting that it’s more important for any candidate he interviews to define what they’ve learned from their experiences, rather than just list them. “I don’t want someone who just floats through things – an attitude of continual learning is important.” One way the panelists suggested cultivating this was through taking online courses or actively focusing on developing new skills. 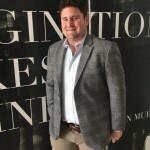 As Robbie Shields, Student Career Counselor at HNC and moderator for the event pointed out, many students wonder about how to get that first job or internship with no previous experience. The key, our panelists emphasized, is patience, flexibility, and a little “fake it til you make it”. 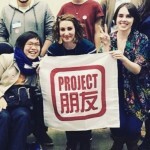 Chynna said that building a career in China may take patience and that you should not be afraid to start at the bottom of an industry and “吃some苦(“chi ku” means to eat bitterness, in other words, put up with it)”. She also pointed out that you don’t necessarily have to be in China to build a China-focused career – often there are companies back home that lack knowledge and insight about China that someone who speaks Chinese or has lived in China may be able to help fill. All of the panelists agreed that building your personal and professional network is very important. 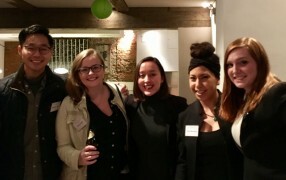 Robbie suggested that building a network is much more like cultivating a “nest” than meeting as many people as you can. “More often than not, it’s through your relationships that you will find a job you want. You may not know a person in that industry or company directly, but maybe your buddy on the basketball team does,” he said. PPLF alumni Brian Lee (Swarthmore alumnus), Emily Oursler (UMD alumnae), and Kiana Mendoza (Claremont Mckenna alumnae) all currently live in Shanghai! “You’d be surprised how many people are willing to help you if you just tell them what you need,” said Francis. “It’s a good idea to keep meticulous records of people you meet, especially people that like you.” In other words, you shouldn’t just be trying to meet people more senior than you when networking, you should be also meeting all different kinds of people who share your interests and values. Finally, Trevor noted: “There are many, many opportunities here; the onus is on your to find them.” With a little patience, flexibility, and time invested in language skills, you will be well on your way to a career in China. After the panel, there was a networking reception with light refreshments, and the room stayed packed with attendees mingling and getting to know each other well over an hour afterwards. 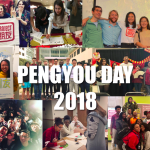 There were Chinese, American, and international students and young professionals in attendance, and it was also a pleasure to see many of our former interns and Project Pengyou Leadership Fellows while in Shanghai as well! Team Pengyou with HNC staff and Panelists! 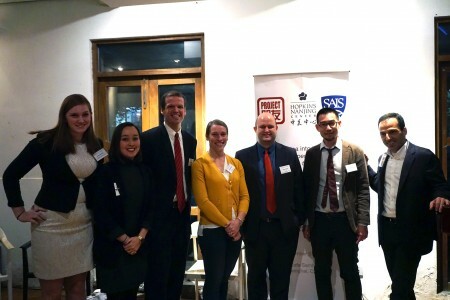 We’d like to extend a huge thank you to all of the guests who came and contributed to a vibrant discussion, the distinguished panelists who were so generous in sharing both their time and their wisdom, and of course, the wonderful staff at the Hopkins-Nanjing Center who are always a pleasure to work with. We hope to hold more similar events in the future, so stay tuned for Project Pengyou – HNC events on building a career in China to come! Hopkins China Forum events are organized under the auspices of The Johns Hopkins University and its affiliated alumni associations worldwide. For more information on Hopkins events in Shanghai, please contact Frank Tsai at the Johns Hopkins University Alumni Association – Shanghai at editor@shanghai-review.org.